Edwin S. Rice, Sr., 95, passed peacefully on May 12, 2018 at Rosewood Health & Rehab, Independence, MO. Ed was born June 21, 1922 to William H and Laura (Belisle) Rice. He attended Pitcher School, William Chrisman HS and then Raytown HS where he was VP of his graduating class. 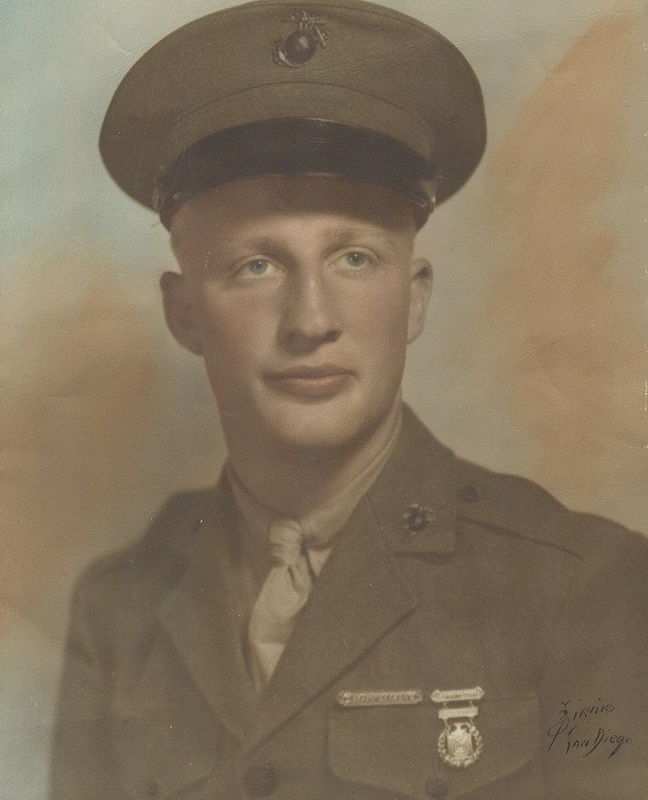 Ed joined the Marine Corps in 1942 and served in the South Pacific at Guadalcanal & Bougainville. He was honorably discharged in 1945. Ed married Madaline J Byler and they raised 4 children while Ed worked as a masonry contractor until his retirement at 79. Ed was a published poet and Sr. Poet Laureate of MO, a manager for Raytown Little League Baseball for many years, began long distance running at the age of 51, completing 9 marathons, enjoyed playing cards and had a wonderful sense of humor. Ed recently participated in the Heartland Honor Flight to Washington, DC. Ed was preceded in death by his parents and 6 siblings, wife Madaline Byler Rice, wife LaVonne Brown Rice, companion, Betty Lloyd, daughter, Lynda, and grandson, Patrick. He is survived by daughters Lynette Rice (Sun City West, AZ), Shirley Rice (Independence, MO), son, Edwin Rice, II (Climax Springs, MO), 6 grandchildren, 15 great grandchildren and numerous great great grandchildren. The family wishes to thank Rosewood Health & Rehab and One Community Hospice for their kind and loving care. The family suggests memorial contributions to One Community Hospice, 15600 Woods Chapel Rd., Ste. A, KCMO 64139, onecommunityhospice.com or Heartland Honor Flight, PO Box 843930, KCMO 64184, heartlandhonorflight.org/donate.php. Visitation will be 6-8PM, Thursday, May 17 at Park Lawn, 8251 Hillcrest Rd. Graveside Service with Military Honors will be 11AM, Friday, May 18 at Brooking Cemetery, 10004 E. 53rd Street, Raytown, MO. Shirley, I will miss Ed. I loved listening to his stories and I loved his love for life. 95 had nothing on him! I am honored to have known him, taken care of him, and loved him. God bless you and keep you in your time of loss.